This work proposes and studies several navigation and selection techniques in virtual environments using Microsoft Kinect®. This device was chosen because it allows the user to interact with the system without need of hand-held devices or having a device attached to the body. 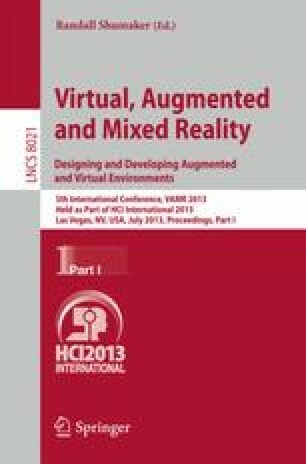 This way we intend to increase the degree of virtual presence and, possibly, reduce the distance between the virtual world and the real world. Through these techniques we strive to allow the user to move and interact with objects in the virtual world in a way similar to how s/he would do so in the real physical world. For this work three navigation and three selection techniques were implemented. A series of tests were undertaken to evaluate aspects such as ease of use, mental effort, time spent to complete tasks, fluidity of navigation, amongst other factors for each proposed technique and the combination of them.